It’s the Sinulog sa Kabataan sa Lalawigan Saturday, January 11, and school contingents will go on a parade from Capitol to the Cebu City Sports Center using Osmeña Boulevard at 1 p.m.
As a result, Citom and the traffic patrol group of the Cebu City Police Office will reroute vehicular traffic on the affected streets beginning at noon up to the end of the activity tomorrow. Here’s the list of jeepneys and the streets they will be using during the rerouting. Passenger jeep with Route No. 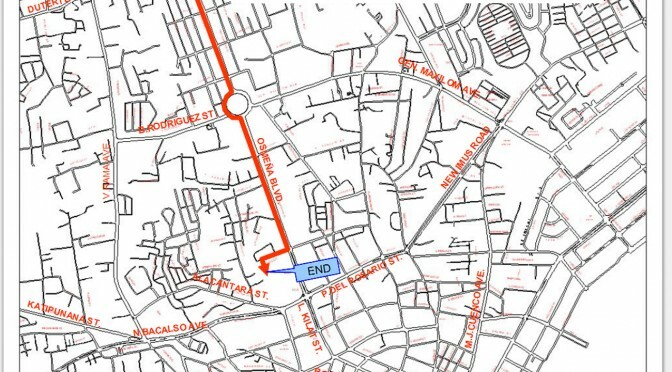 03B – turn left to F. Ramos St., right turn to Junquera St., right turn to Sanciangko St., left turn to Osmeña Blvd., to their usual route, then to their point of origin. Passenger jeep with Route Nos. 04B, 04D, 04E, 04H, 14D, 17B and 17D – go straight to Gorordo Ave., turn right to Gen. Maxilom Ave., left turn to F. Ramos St., right turn to Junquera St., right turn to Sanciangko St., to their destination at downtown area while route No. 14D shall turn left to Colon St., right turn to Mabini St., right turn to V. Gullas St., to their usual route, then to their point of origin. Passenger jeep with Route Nos. 14B and 15 – turn left to Gov. Roa St., left turn to Maria Cristina St., right turn to Juana Osmeña St., right turn to Gen Maxilom Ave., left turn to F. Ramos St., right turn to Junquera St., right turn to Sanciangko St., to their usual route, then to their point of destination. Passenger jeep with Route Nos. 06B, 06C, 06D, 06E, 06F, 07B, 07C, 07D, 07E and 07H – go straight or turn right to V. Rama Ave., left turn to N. Bacalso Ave., right turn to Osmeña Blvd., then back to their usual route to downtown area. Passenger jeep with Route Nos. 12L and 06H – turn right or go straight to V. Rama Ave., left turn to N. Bacalso Ave., left turn to Osmeña Blvd., right turn to N. Escario St., then to their destination. * From North Area, Route No 12L shall turn left to Gorordo Ave., right turn to Gen. Maxilom Ave., left turn to F. Ramos St., right turn to Junquera St., right turn to P. del Rosario St., then to their point of origin. * Route No. 06H shall go straight to Gen. Maxilom Ave., left turn to F. Ramos St., right turn to Junquera St., right turn to P. del Rosario St., proceed to N. Bacalso Ave., then to their point of origin. In a press statement, Citom and the traffic patrol group advised motorists, drivers, and other road users to follow the traffic signs installed on the re-routing areas to minimize traffic congestion.